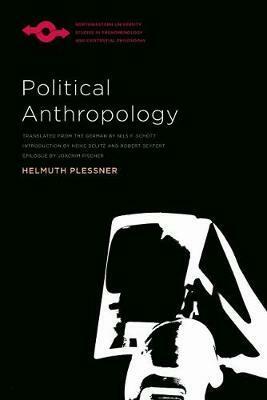 In Political Anthropology (originally published in 1931 as Macht und menschliche Natur), Helmuth Plessner considers whether politics-conceived as the struggle for power between groups, nations, and states-belongs to the essence of the human. Building on and complementing ideas from his Levels of the Organic and the Human (1928), Plessner proposes a genealogy of political life and outlines an anthropological foundation of the political. In critical dialogue with thinkers such as Carl Schmitt, Eric Voegelin, and Martin Heidegger, Plessner argues that the political relationships cultures entertain with one other, their struggle for acknowledgement and assertion, are expressions of certain possibilities of the openness and unfathomability of the human. Translated into English for the first time, and accompanied by an introduction and an epilogue that situate Plessner's thinking both within the context of Weimar-era German political and social thought and within current debates, this succinct book should be of great interest to philosophers, political theorists, and sociologists interested in questions of power and the foundations of the political. Helmuth Plessner (1892 -1985) was a leading figure in the field of philosophical anthropology. He was the author of more than thirteen books, including The Limits of Community: A Critique of Social Radicalism, The Levels of the Organic and the Human, and Laughing and Crying: A Study of the Limits of Human Behavior. Heike Delitz is a Privatdozent in general sociology and social theory at the University of Bamberg. She is the author of Bergson-Effekte: Aversionen und Attraktionen im franzoesischen soziologischen Denken (The Bergson Effect: Aversions and Attractions in French Sociological Thought). Joachim Fischer is an honorary professor of sociology at TU Dresden and president of the Helmuth Plessner Society. He is the author of Philosophische Anthropologie: Eine Denkrichtung des 20. Jahrhunderts (Philosophical Anthropology: A Current of Thought in the Twentieth Century) and Exzentrische Positionalitat: Studien zu Helmuth Plessner (Eccentric Positionality: Studies on Helmuth Plessner). Robert Seyfert is an Akademischer Rat (senior researcher/lecturer) at the Institute of Sociology at the University of Duisburg-Essen, Germany. He is the author of Das Leben der Institutionen: Zu einer allgemeinen Theorie der Institutionen (The Life of Institutions: Toward a General Theory of Institutions). Nils F. Schott, the James M. Motley Postdoctoral Fellow in the Humanities at Johns Hopkins University, is a widely published translator of work in the humanities, including Vladimir Jankelevitch's Henri Bergson.